After sliding in Venetica's disc and watching through the opening cutscene, you might ask yourself: “Does this game want me to hate it?” While the answer is (most likely) no, Venetica often feels like it's outwardly trying to be bad. The graphics are so glitchy and poorly rendered that they would have looked terrible on the PlayStation 2 or GameCube, which could be excused if the game had any other redeeming qualities. Sadly, it doesn't. Playing Venetica is a dizzying experience - not because it's amazing in any way, but because the game will actually make you dizzy. Between the sharp light contrasts, the erratic camera movement and the near-impossible-to-see subtitles, the game's visual aesthetics feel like an obstacle to gameplay rather than a part of it. At one point, we were fleeing from assassins to open up a better combat position and we accidentally triggered a cutscene. In response, the assassins casually stood behind us, swords drawn, and waited for us to finish talking before they decided to ambush and kill us. That's Venetica in a nutshell. 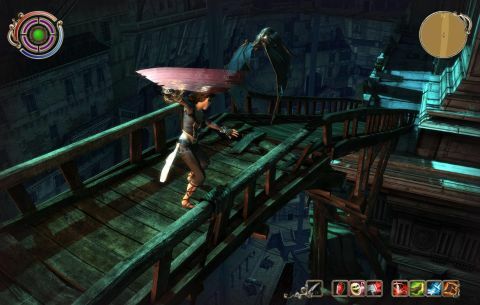 The basic gimmick is kind of neat: you play as the daughter of Death, which allows you to bounce between the real world and a twilight realm of death or something that is never quite explained properly. Many enemies and bosses can only be defeated in that twilight realm, so you'll have to switch in and out over the course of a 15 to 20-hour journey that takes you through 16th century Venice. Most of the time you'll just be rolling around and slashing, though. That's because combat in Venetica focuses solely on button-mashing. Enemies take forever to go down and you'll spend most of your time dodging their attacks and trying to slash them from behind before they hit you. If you die, you can come back to life several times (based on a number bar that's referred to as your “twilight energy”) thanks to your special skills as Death's daughter, which makes things even duller. Once you get to Venice, you can join one of several guilds, each of which offers you access to a number of skills and rewards. Enlist in the Order of the Holy Seal, for example, and you'll be able to enhance your melee stats and collect a few different powerful swords. Skills and spells can also be learned by placing points into the appropriate skill trees and finding the right trainers. You'll be able to steal life points, summon birds, and cause hurricanes – not very deep, but it adds some much-needed variety to the monotonous battles. At times it seems like every aspect of Venetica was designed to infuriate the player. There are dialog trees, for example, but the text of each branch is too small to read. You can't pick up loot or open doors without unequipping your weapon. A gigantic red border blocks out half the screen when your health is low. The map is tough to navigate without causing a headache. The voice acting is annoying. The dialog is poorly written. The controls are clunky. Sometimes the whole thing feels like one big practical joke. It's impossible to recommend Venetica to anyone when there are so many other better action-RPGs out there. You might be tempted to pick it up because it's only forty dollars, but don't do it... unless you've already played every other RPG on the market. Glitch-filled, ugly RPG that's hard to play and even harder to enjoy.